Digi-Schlock: THE WILD WEST COLLECTION (Shout Factory 2-For-1 DVD) – Schlockmania! Jim Brown fans, take note: this a disc for you. The Wild West Collection moniker is truthful, as this represents a pair of westerns for 20th Century Fox’s back catalog, but it’s also a double bill of movies with Jim Brown. However you slice it, it’s another strong catalog release from Shout Factory that is likely to entertain budget-conscious cult movie fans. Both films are presented in anamorphic transfers here. Rio Conchos is presented in its full Cinemascope format, a first for domestic home video, and it looks suitably sharp and colorful. Take A Hard Ride, which had previously been issued on disc by Anchor Bay Entertainment, also looks nice in this presentation. Mono mixes are used for both films, presented in Dolby Digital, and both sound fine. In terms of extras, trailers are provided for each film: the trailer for Rio Conchos comes from a rough-looking element and Take A Hard Ride comes from a video source but both are a fun view for fans. 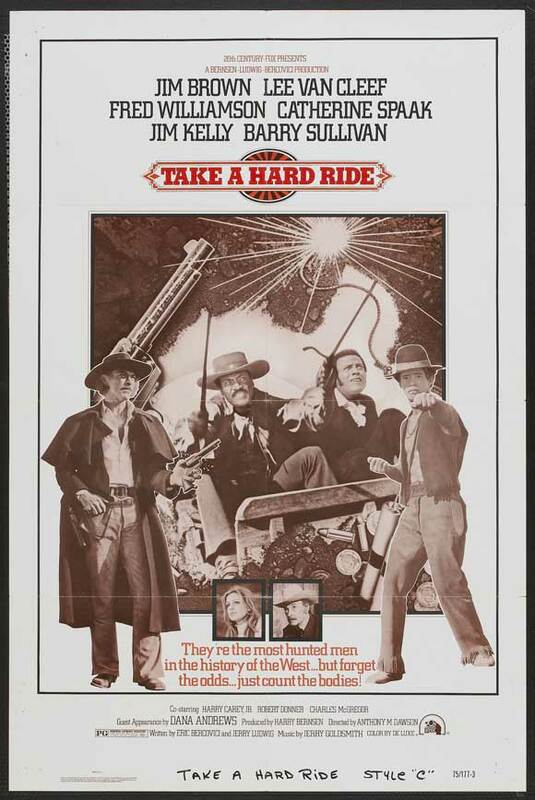 There are also a couple of new extras included with Take A Hard Ride in the form of interviews with Jim Kelly and Fred Williamson. Kelly gives the viewer a thumbnail sketch of how his career began and offers a few choice memories about the shoot in a gentle but articulate style. Williamson’s interview is a little longer and features him discussing his love of westerns, what it was like to work with Jim Brown and how he and Brown choreographed their own fight at the end of the film. As always, Williamson is an energetic raconteur and fun to watch. In short, the presentation is nice on both titles and a few extras further sweeten an already generous deal. 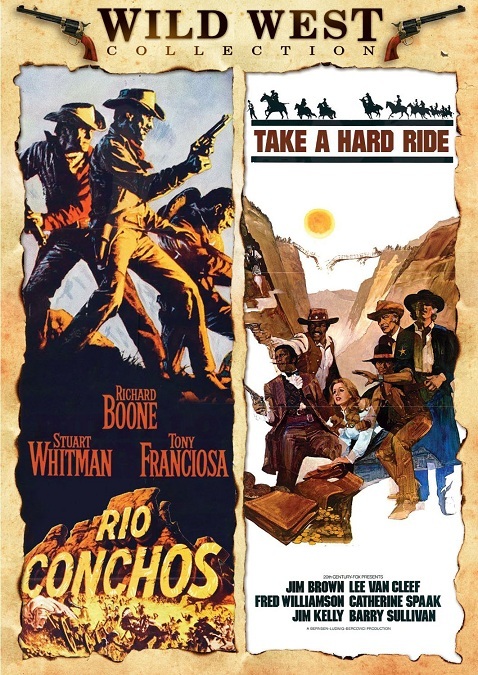 Whether Jim Brown movies or westerns are your thing, this double-bill of Rio Conchos and Take A Hard Ride offers something for a broad swath of cult movie fans. 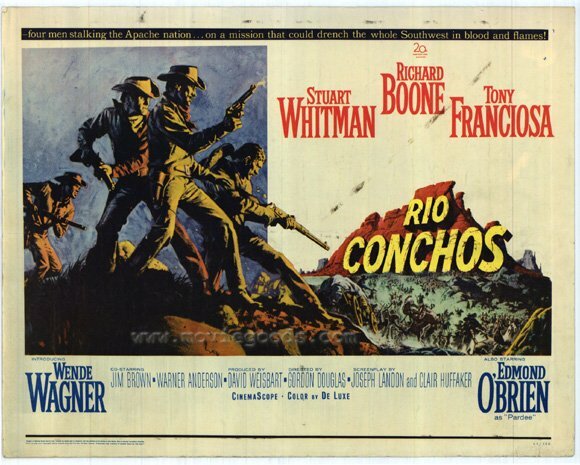 Rio Conchos / Take A Hard Ride – Double Feature Rio Conchos: In avenging himself against the Apache Indians who have massacred his family, ex-Confederate Army officer Lassiter (Richard Boone) recovers a stolen U.S. Army repeating rifle and finds himself arrested by the U.S. Army in connection with the stolen firearm. Lassiter is offered his freedom if he leads a small group into Mexico, consisting of an Army captain (Stuart Whitman), a Buffalo Soldier sergeant (Jim Brown, in his film debut), a knife-wielding Mexican prisoner (Tony Franciosa) and an Apache woman warrior. After blasting their way through bandits and Apaches, they discover a megalomaniacal Confederate soldier (Edmond O’Brien) selling guns to the Apaches.Take A Hard Ride: Take a tough-as-nails trail boss (Jim Brown, The Dirty Dozen), a smooth gambler (Fred Williamson, Black Caesar), a ruthless bounty hunter (Lee Van Cleef, The Good, The Bad And The Ugly), a mute martial arts master (Jim Kelly, Enter The Dragon), a desperate prostitute (Catherine Spaak, Cat O’ Nine Tails) and hundreds of greed-crazed gunmen. Turn them all loose in a chase to the Mexican border for a fortune in gold, and you have the action-packed epic Take A Hard Ride. Hollywood legends Dana Andrews (Laura), Barry Sullivan (The Bad And The Beautiful) and Harry Carey Jr. (The Searchers) costar.